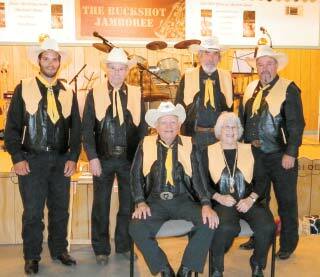 COMMUNITY PROFILE: Buckshot Jamboree is a HOOT! BUCKSHOT JAMBOREE BAND: SEATED, Buck Sloan and Shirley Sloan; STANDING, Kaleb Jordan, Dusty Stewart, Jerry Orvis, and Royce Mel- ton. This group of old-timers will put a smile on your face, and heart, and your foot will be tapping all night! 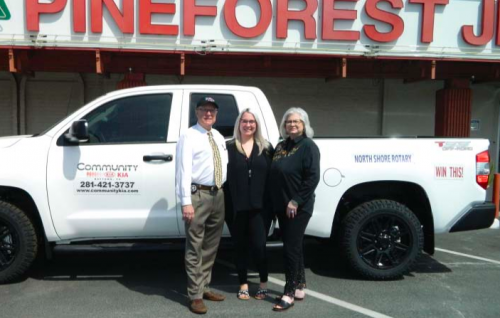 NORTH SHORE – A treasure of country western music is right here in North Shore. 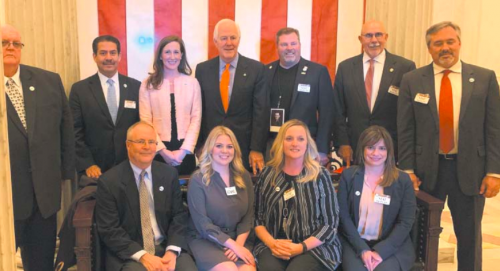 If you are looking for an enjoyable way to spend a Saturday evening, in a friendly, fun non-alcoholic environment, the Buckshot Jamboree will more than live up to your expectations. The Jamboree is a life-long dream of Buck Sloan, realized in his own building on a side road, Hartman Street, off Old Beaumont Highway. 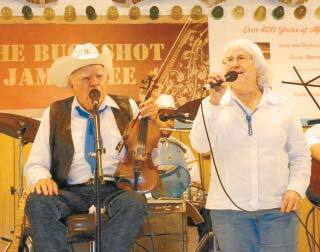 Buck and his wife Shirley, and their band “The Buckshots” play every Saturday evening for three hours, to an audience that varies from 50 to 200. The music is classic country western, with some rock and contemporary thrown in for variety. And the sounds they make are wonderful, and bring back memories to most everyone attending. Although the same band plays every Saturday, the program is always different, with four or more guest artists singing and playing. On a recent Saturday, we listened to Mary Dooley, Johnny Lee, Derrick Gough, Don Gough, and Pamela Walker. Classic country songs included Because You Care, Fool #1, Jealous Heart, Mona Lisa, the Keys in the Mailbox, Just Walk on By, All My Exes Live in Texas, Tennessee Waltz, There Goes my Everything, and my favorite, an Elvis rendition of Heartbreak Hotel by Derrick Gough. Buck and wife Shirley sing a duet, the standard way to open the evening. As a spoof, Buck wrote a song “Help me make it through the night” with the lyrics “Come and lay down by my side/and pretend you haven’t died,” a good natured look at how they have aged and cared for each other. They have been married 38 years, having met at a beer joint in Lufkin, where they first lived. 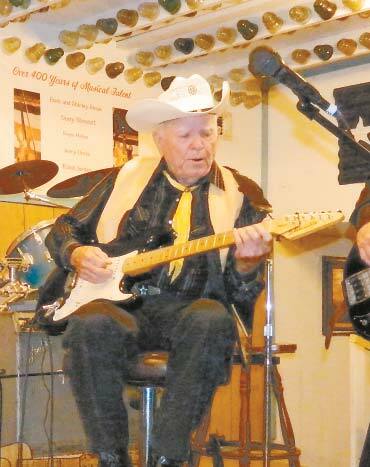 Buck Sloan proudly claims that his band is the “oldest” country western band in Texas. By that, he means the toal age of the performers. Buck is 89, his wife Shirley 74, his musicians Jerry Orvis 76, Royce Melton 58, Dusty Stewart 83, and the youngster Kaleb Jordan 23. Buck was born in 1924, and with the depression coming on, his one possession was a guitar for entertainment. Later he served in WWII, was wounded and received the Purple Heart. You may have heard Buck in another venue previously. He and Shirley played at the Jacinto City Opry, and at The Hitching Rail off C. E. King in past years. BUCK SLOAN plays the piano, guitar, and fiddle. He is in the Western Swing Music Society of the Southwest Hall of Fame. The band includes guitar player Jerry Orvis, bass guitar Royce Melton, Steel Guitar player Dusty Stewart, and percussion/drummer Kaleb Jordan. Other musicians often sit in on the band, and each Saturday performance features four or more guest singers/performers. Buck and Shirley have only had the Jamboree and the building for a few years. They formed the Buckshots in 2007, and moved into their building about three years ago. Even though he is 89, he reminds us that his mother lived to 102, and we hope Buck does too, and keeps on pickin’ and playing. Shirley says “We are trying to preserve and keep Classical “Old Time” Country Music alive. You can catch their show at 7414 Hartman every Saturday, from 7 pm to 10 pm. 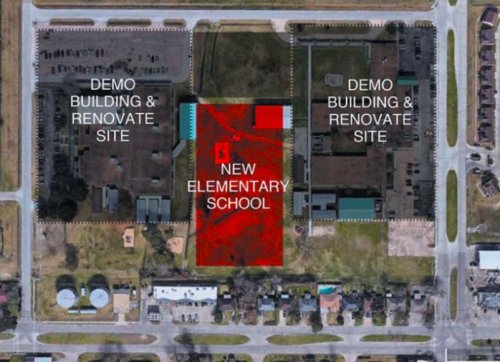 Take C. E. King or Beltway East to Old Beaumont Highway, then to Hartman. Admission is a $7 donation for adults, and $3 for kids. You can come early or late, and have a good time. It is such an informal and friendly place that you will feel right at home.